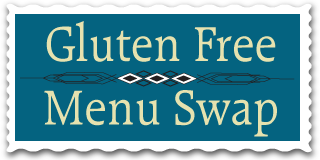 This week’s theme for the Gluten Free Menu Swap is “quick and easy” over at Gluten Free Goodness. We’ve been doing quite a bit of quick and easy lately too. Tex-Mex Lasagna and salad – this is a go-to recipe for us, we vary it a bit and make more than the recipe calls for so that we can eat on it for a couple of days. Plus I have a lot of discounted Tinkyada lasagna noodles that need to be eaten up. Ma Po Tofu with rice and steamed broccoli – we will omit the meat in the Ma Po. I would also like to make some Irish Soda Bread this week, either from my go-to recipe from a Bette Hagman cookbook that I have been making for years, or one of these new ones from Amy or Karina. Be sure to head over to Gluten Free Goodness later this week to see everyone’s inspirational posts. You can also check out OrgJunkie for hundreds more meal plans, literally, although you will need to adapt them to fit your families needs and taste buds. Yum! Your menu sounds delicious this week (as always). I love your chickpea curry – I need to make it again soon! Ma po tofu is yummy. I’ve never made it but one of my chef friends does and his is extraordinary. I should get his recipe! Tex-Mex lasagna looks mouth-wateringly good and super simple. Sigh. Cheese makes everything easier! But vegan cheese is not that good and *really* expensive. Thanks for commenting on my post! I am super excited about the vitamix but I also have the feeling I had after I lusted after a Dutch oven for so long and finally got one, where I’m like, “Uh oh. What am I actually going to use this for? Was I just lured in by its shiny fanciness?” Although we made smoothies last night and they pretty much rocked our worlds. Just frozen fruit and water and a little agave, and we had Jamba-Juice-textured drinks.